Can't wait to share the exciting running or the perfect surfing? Now, you don't have to go home to edit GoPro 4K/1080p video and then share the meaningful moment with your friends. Instead, it's damn easy for you to instantly trim/resize a GoPro video clip and upload GoPro to YouTube for sharing as long as you have the GoPro App installed on your mobile device. Go to App Store or Google Play store to get this application download on your iPhone iPad/Android. When the App download is finished, you can follow the below guide to trim and upload GoPro 4K UHD/1080p video to YouTube without latency time. Step 1: Launch your GoPro app on your iPhone iPad or Android. Connect your GoPro camera to your GoPro app via the same Wi-Fi connection. Please make sure both the GoPro camera software and GoPro App are updated to the latest version. Step 2: Play the GoPro recorded video that contains the important moments you wanna share to YouTube. Step 3: Tap the scissor-shaped icon to trim GoPro video clips when the highlight moments appear on the playing video. In general, the default video length is 15 seconds. Yet, you can change the GoPro video duration to 5 seconds or prolong it to 30 seconds. Afterwards, replay the trimmed video clip to ensure your desired video clips all covered. If there is something wrong with the start time or end time, move the slide bar to adjust the time. Step 4: Choose "Next" after everything is errorless. Afterwards, save the GoPro video to your mobile device. Note: in case you're prone to compress and upload GoPro video to Facebook or Instagram, you can directly share GoPro video to them. As for YouTube, there is no shortcut way to directly upload GoPro to YouTube. Step 5: Go to the iPhone iPad's photo album ("My GoPro Album" in Capture or the GoPro App on Android) > select GoPro Album > tick the thumbnail of the video > tap the share icon and choose uploading to YouTube. Alternatively, you can also resort to YouTube app to directly upload GoPro video to YouTube. 1. 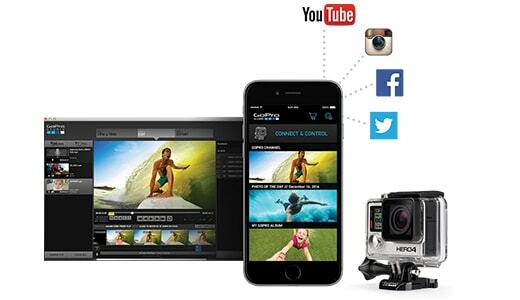 GoPro App allows you to edit GoPro video to maximum 30 seconds in length. If you wanna trim GoPro video to 1 minute or 5 minutes, this application is powerless to render you such help. 2. The latest GoPro Hero 6 automatically records 4K/2K/2.7K/1080p video at HEVC codec to save file size up to 50%. That is wonderful. However, the downside is that some YouTube viewers (if not all) might be unable to watch your GoPro HEVC video on YouTube because of the unqualified hardware configurations. 3. The common 1 minute GoPro video at 30FPS in HEVC codec will take up 353MB in 1080p, 325MB in 2K 1440p, 349MB in 2.7K and 493MB in 4K. And 1 hour of a GoPro video at 30FPS in HEVC codec will take up 21GB in 1080p, 19GB in 2K 1440p, 20GB in 2.7K and 29GB in 4K. GoPro video is too large to upload to YouTube. Attention: the GoPro video file is based on HEVC codec. When it comes to H264 codec, the video file size will be increased 2 times. 4. GoPro video won't upload to YouTube via GoPro app sometimes. Mostly, it gets stuck at "processing" and then later gives you error video failed to process with the message: "Failed (unable to convert video file)". This might be caused by GoPro video resolution (e.g., 2K, 2.7K), frame rate (100FPS, 240FPS), etc. In such cases, you're suggested to use another GoPro video converter to trim GoPro video to any length you want, convert GoPro HEVC codec to YouTube recommended H264 codec, compress and reduce GoPro file size, change GoPro resolution from 2K/2.7K/960p to YouTube supported 1080p/720p/480p and ajust GoPro frame rate. Luckily, there is an all-round video converter for GoPro - MacX Video Converter Pro, which empowers you to customize your GoPro video so as to successfully upload to YouTube. What Can GoPro Video Converter Do to Make GoPro Smoothly Upload to YouTube? 1. The built-in video editing feature allows you to enable "Trim" feature to freely set up GoPro video start time and end time. Generally, the YouTube default video duration is 15 minutes, maximum length 12 hours. Thus, you can gain more control over GoPro video length with a balance between GoPro video duration and file size (less than 20GB). 2. As its name implies, its top duty is to convert videos. So it's a piece of cake to convert GoPro video from HEVC to H264, FLV, 3GP, WMV (YouTube recommended codecs with excellent compression ratio and compatibility) at 98% quality reserved (High Quality Engine supported). And don't worry about conversion speed, for it's GPU hardware accelerated by Intel/Nvidia/AMD. 3. When GoPro to YouTube uploads failed, this GoPro video converter comes to rescue your GoPro large-sized file, video resolution and frame rate. Just activate its "Settings" feature and then you can change GoPro resolution from 2K/2.7K/960p to YouTube 1080p/720p to shrink GoPro file size, tweak frame rate to YouTube 30/60FPS and lower bit rate 20% - 40% to resize GoPro large-sized file. How to Convert and Adjust GoPro Video? Launch this GoPro video converter on your macOS computer or Windows after the download process is finished. Tap "Video" icon to import your GoPro videos. 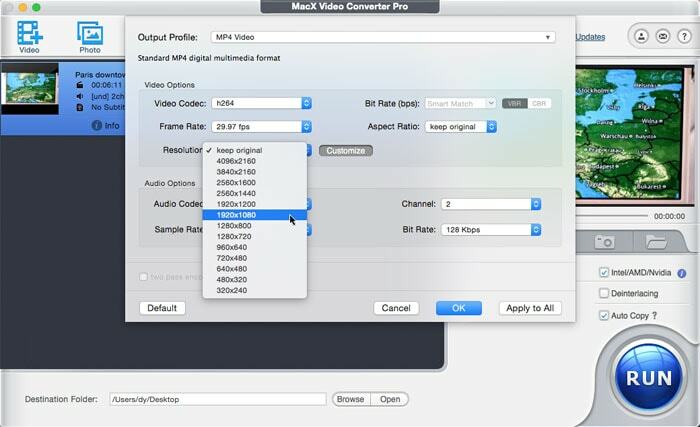 Afterwards, select "MP4 Video (H264)" from "General Profile" as output format. You can also choose FLV, 3GP, WMV, etc. YouTube supported video formats from "Web Video Profile" and they even have better video compression ratio than H264 codec to make your GoPro video even smaller at certain price of quality. On the main interface, tap the scissor-shaped icon to enable its video editing features, among which Trim and Crop might be helpful to you. • Click Trim and tick "Enable Trimming". Then you can move the slide bar to set up GoPro video duration or fill number in the below "Start/End Time" boxes. • Click Crop & Expand and enable Crop box, which lets you adjust GoPro video image size (height & width) to remove unnecessary black borders. Tap the video parameter setting button with a gear icon to adjust GoPro video resolution, frame rate, aspect ratio, bit rate, etc. to better suit YouTube upload requirements and lower the upload failure risk. Considering some of you are new to the parameter settings and have no idea how to adjust them to meet the requirements of YouTube, here we list out the detailed YouTube upload requirements for your reference. So, grounded on the above table, you can begin to compress 4K to 1080p to reduce GoPro video size if your video file is too large to upload. Or manually change GoPro video frame rate from 240FPS to 60FPS or 60FPS to 30FPS, adjust bit rate from 80Mbps to 60Mbps, etc. Warm prompt: the general GoPro 4K video or Ultra HD video is comparatively large in size, which makes it difficult and much slower to upload to YouTube. Hence, to compress GoPro video size to faster upload, adjusting video resolution, frame rate and bit rate are regarded as the effective solutions besides the aforementioned video codec conversion. Tap "RUN" button and this GoPro video converter yet compressor will begin to convert GoPro video codec and apply all the changes to GoPro video (trim/parameter adjustments). When the GoPro video compression conversion is finished, you can eventually upload GoPro 4K/1080p/720p video to YouTube via computer. Follow the below GoPro to YouTube uploading guide if you have no such experience on computer. Step 1: Save GoPro video on your computer after the GoPro video editing is accomplished. Once again, check if your GoPro meets the YouTube video upload requirements before you go to next step. Step 2: Sign into YouTube using your account. Followed by a tap on "Upload" button. Step 3: Select the GoPro video file you desire to share on YouTube and then click "Open". Step 4: Give your GoPro video a title and description. Plus, additional settings are available for you to adjust (Privacy or Public). Step 5: Choose a thumbnail photo for your GoPro video to let other YouTube viewers see a quick overview image of what they should expect to see in your video. It would be much more attractive if you choose a clear yet sharp image with eye-catching elements. Step 6: Press Save. The title and description will be saved when GoPro video has completed uploading. Afterwards, you can copy the embed YouTube URL to Google Plus, twitter, facebook, etc. social network sites. 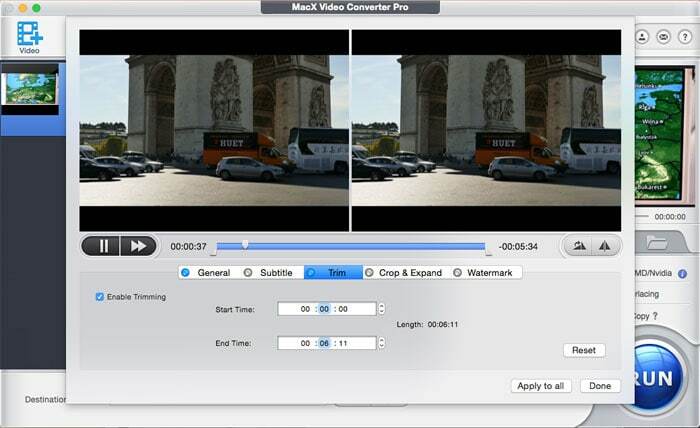 MacX Video Converter Pro is your silver bullet when you're stuck in uploading GoPro video to YouTube, cuz it can help you compress large-sized GoPro 4K/2.7K/1080p video to samller size, convert GoPro video from HEVC to H264 or vice versa, trim GoPro video length and adjust GoPro video resolution, frame rate, bit rate to meet all YouTube upload requirements. Smaller means faster. Compress video for YouTube faster upload. 3 ways are available to reduce MP4 for YouTube uploading. Top video shrinker makes video much smaller with 66% size off.